In this week's Abundance Insider: Power-producing paint, pressure-sensing Silly Putty, and Google’s fossil fuel-free future. What it is: Scientists at the Ulsan National Institute of Science and Technology claim to have created a thermoelectric coating that can be directly painted onto almost any surface. Their goal was to create thermal generators that capture and convert waste heat into electricity from objects of almost any shape, including round and irregular surfaces. This inorganic thermoelectric paint was created using Bi2Te3 (bismuth telluride) and Sb2Te3 (antimony telluride) particles, creating two types of semiconducting material. 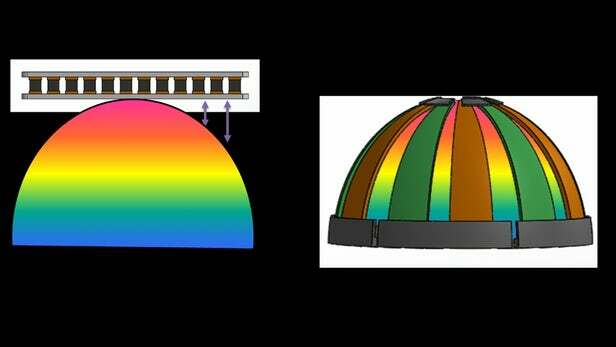 The researchers tested the mixture by applying alternate p-type (positive) and n-type (negative) layers of the paint on a metal dome, which generated an average power output of 4 mW per square centimeter. As a result, the UNIST prototype can be applied to almost any surface with just a paintbrush, placing itself as a new type of new and renewable energy-generating system in the near future. 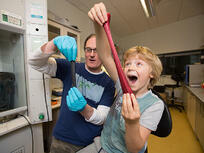 What it is: Physicist Jonathan Coleman and his team at Trinity College in Dublin are combining Silly Putty with a special form of carbon to create a new material believed to someday be useful in making medical devices. The combination of graphene and Silly Putty results in a material that is still runny and bouncy, but now conducts electricity and is extremely sensitive to pressure -- even the tiniest amount of pressure changes its electrical resistance. In the future, Coleman believes, this material could be used pressed against a person's carotid artery to measure their pulse and blood pressure. What it is: Breakthrough Energy Ventures (BEV), a newly created fund founded by Bill Gates, Jeff Bezos, Vinod Khosla, Jack Ma, John Doerr and 15 other high-profile investors, will pour at least $1 billion into clean tech companies at all stages over the next 20 years. In true moonshot style, their goal is "to provide everyone in the world with access to reliable, affordable power, food, goods, transportation, and services without contributing to greenhouse gas emissions." What it is: Hello Tractor connects Nigerian tractor owners with farmers via SMS, creating a service where, as Take Part describes, the tractor owner "drives the tractor to the farm, provides the labor, and is paid $75 per hectare." At a third of the cost of manual cultivation, the farmer benefits and the tractor owner increases her wages by 500%, from the $5 that would be possible via manual labor to $25 after "fuel, maintenance, and repair costs, as well as loan repayment" on the tractor. What it is: Available in limited quantities, Adidas put its new 3D printed running shoe on sale in London, New York and Tokyo. While not bespoke, the 3D Runner features unique technical features like a heel counter integrated into the midsole, and variable density areas, which are hard to replicate via traditional methods like gluing and stitching. What it is: Urs Hölzle, Google's Senior Vice President for Technical Infrastructure, announced that its entire global business will be powered by renewable energy in 2017, making good on a pledge made back in 2012. Although Google is not the only global corporation striving towards a fossil fuel-free future, it is by far the world's largest corporate buyer of renewable power -- 2,600 megawatts of wind and solar energy, mostly from wind farms. Although the U.S. administration has pledged to water down climate-change agreements, Urs Hölzle made it clear that Google will not divert from its commitment to renewable energy.